On the feast of St. Jerome, at least very short post is in order. We are all well aware of the fact that St. Jerome was the greatest Scripture scholar of the early Church. He knew many languages, he translated the Bible, he worked with manuscripts. He was also the most respected commentator – until the most recent years, St. Jerome was the Church Father most often read in the Divine Office. It is arguable that St. Jerome was the most intelligent man in the world during his time, he certainly had an incredible capacity for learning new things and remembering even the smallest details of things he had learnt long ago. It strikes me, then, as particularly interesting that this Father most closely associated with the Bible got some of the most important biblical questions wrong! St. Jerome did not consider much of what the Protestants now call the deuterocanonical books to be part of the Canon of Scripture. The great scholar, at the time when the Canon was being formed, took the wrong side – favoring the late Judaic Hebrew Canon over the Judaic Greek Alexandrian Canon (which is very close to the one we now accept). It was not St. Jerome who led the Church through this most difficult crisis, but St. Augustine. 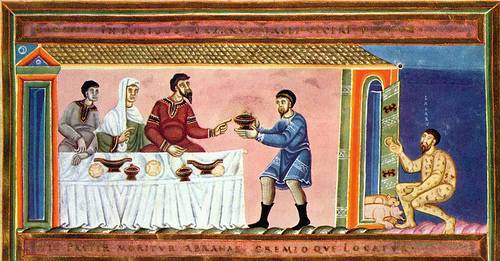 Though a bishop, St. Augustine did not know Greek well and he didn’t know anything of Hebrew. St. Jerome was far superior to the Bishop of Hippo when it came to biblical theology, knowledge of the Bible, and knowledge of languages…yet God chose St. Augustine to be the Father most instrumental in giving the Canon of Scripture to the Church. As today is the feast of three of the holy archangels and Saturday will be the feast of all the guardian angels, I would like to make a short series of posts on the angels. Much of what I write in the posts over the next few days will be heavily rooted in the thought of St. Thomas Aquinas – this seems particularly fitting, since he is called the Angelic Doctor. I would recommend that we all re-read his treatise on angles from the Summa Theologica I, qq.50-64, and also his discussion of the way in which the angels participate in the divine governance of the world which can be found in ST I, qq.106-114. The first of these sections discusses the angels more generally – their nature, their mode of knowing, their will, and their creation and fall. The second section deals with their relation to each other and to humanity. ST I, qq.50-64 will answer the following questions and many more: How many angels are there? How many angels can stand on the head of a pin? Can an angel be in two places at the same time? Can an angel be in any place at all (since they are immaterial)? How do angels know things if they do not have sense experiences? Were the angels created good? How did some of the angels fall? Was Satan the greatest of the angels, before he fell? ST I, qq.106-114 answers these and other questions: Do the angels speak to one another? Is there a hierarchy of angels? Do some angels command other angels? Do seraphim ever come to earth? Does each human being have a guardian angel? Did Christ have a guardian angel? Will the anti-Christ (presuming he is human) have a guardian angel? I will attempt to answer some of these questions in future posts, but for now (to get the ball rolling) I would like to take a slightly lighter question: Why do the archangels have men’s names? As we consider the parable in today’s Gospel text, we are struck by the reality and the real possibility of hell. Not only is hell real, it is something that could befall any of us. Let me explain. Even if we are among the few who actually believe that hell exists, there is still a great temptation to reserve damnation for only the most hardened criminals, those guilty of hideous and unspeakable crimes – murderers, child molesters, war criminals, etc. Only these select few, who are characterized as being so evil as to have nearly lost their humanity, only these will go to hell. And then we are confronted with today’s Gospel. On the feast of Padre Pio, many good Catholics and also many non-Catholics and even atheists recall the stories of his miraculous bilocations. St. Pio of Pietrelcina was known to have bilocated many times throughout his life, a phenomenon which has become central to the telling of his mystical life. Of course, Padre Pio was not the only saint to have bilocated, but he is certainly the saint most commonly associated with the mysterious gift. Without denying the fact of bilocation as a phenomenon, there is still some difficulty in explaining just what this event really is. By “bilocation,” do we mean that Padre Pio was present in two places at the same time? If yes, was he present both in his soul and in his body, or just in his soul? If just in his soul, was he materially present, having acted through a momentarily constructed physical body, or was his presence only a spiritual action visible only to the intellect? What follows is more speculative than most of the writing on this blog. I offer this speculation neither to give any definitive answers nor to induce doubt, but rather to help us all wonder at the glories of God’s works. Recent articles on www.chiesa and articles by various bloggers have brought the Vademecum for confessors back into discussion. This document was published by the Council for the Family in 1997 and speaks, among other things, to the issue of contraception. Let us be clear from the start, THIS DOCUMENT IS NOT MAGISTERIAL TEACHING! However, it does have a certain degree of moral authority as coming from a board of distinguished theologians and published through the Vatican. A second point we need to recognize: the vademecum does not require the confessor to do anything in particular in regards to questioning or advising penitents about contraception. Some people have read far too much into this document and have declared that the current policy of the Church is that confessors are to leave contraceptive couples “in good faith” – i.e. priests ought not to tell people about the Church’s teaching on contraception. This conclusion is simply not true. The document is not a part of magisterial teaching, nor does it make such a strong claim against educating the people. 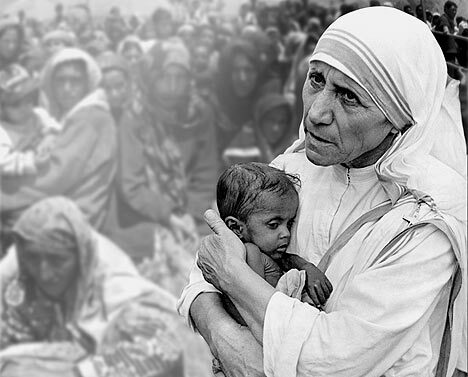 Rather than go into a detailed analysis of the text of the Vademecum, I would like instead to invoke an equally powerful moral authority: Blessed Teresa of Calcutta. I point to Mother Teresa as an example to all Catholics, but especially to preachers – how prudently, lovingly, and courageously did she preach the Gospel of Jesus Christ! The Church has given us the parable of the dishonest steward in conjunction with a most challenging portion of the book of the prophet Amos. The prophet condemns those who would take advantage of the poor and who would rather purchase luxuries than assist the poor in their need (Am 8:4-7). From this perspective, our Lord’s parable takes on an aspect of social justice which might not at first be noticed. We are to imitate the steward not in his dishonesty, but in his generosity in forgiving debts and distributing the material goods at our disposal. 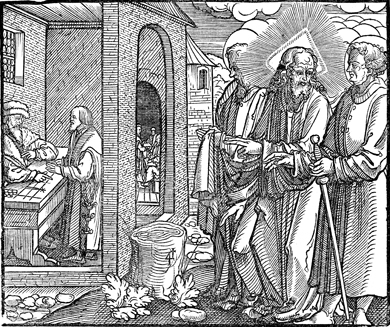 Moreover, this is the interpretation which many of the Father’s of the Church had given this parable: As the dishonest steward distributed the goods which his master gave him, so too we are to generously distribute to the poor the material goods we have been given by God (cf. Ambrose, Basil, Theopholis, Augustine, Gregory the Great, John Chrysostom, and others). However, there is a more fundamental question which this parable raises: If the goods we possess are from God and if the Lord calls our material possessions “what belongs to another,” we ask whether there is any room for private property. Is private property natural? Do we have a right to possess material goods as our own? The answer St. Thomas Aquinas (and the Church’s Magisterium following him) gives to this question is most enlightening. These first words of the New Testament are followed by the long list of ancestors which ultimately culminates with the following words: “Jacob [became] the father of Joseph, the husband of Mary. Of her was born Jesus who is called the Christ.” Have you noticed that this extended family tree is not actually shown to be our Savior’s lineage? 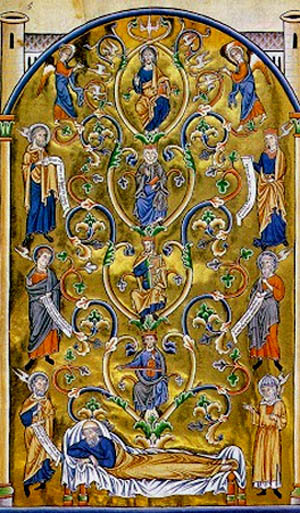 In fact, both Matthew and Luke give the genealogy not of Jesus, but of Joseph. Since Jesus was not truly Joseph’s son, it is Mary’s genealogy which would reveal to us the Savior’s ancestry – But do we have any idea who Mary’s ancestors were? As pointed out in yesterday’s post on the Nativity of the Blessed Virgin Mary, the Church had universally accepted the immaculate birth of Mary – that she was sanctified in the womb and born without sin – long before the dogma of the Immaculate Conception was being thought about. 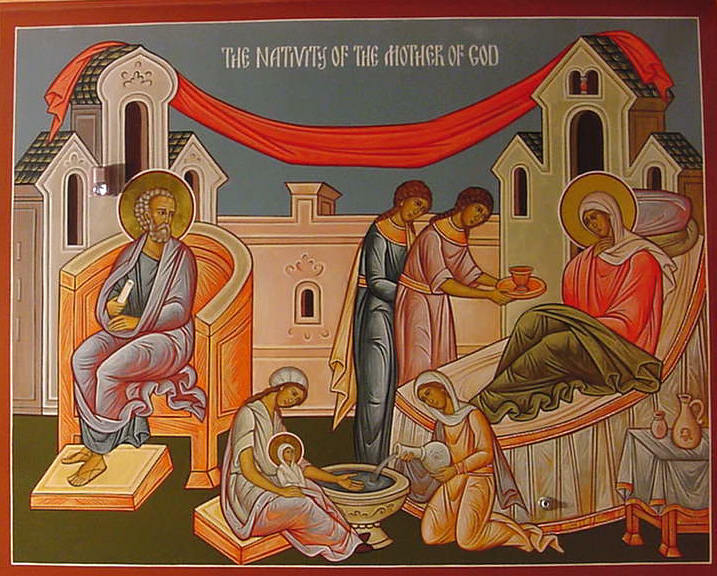 Much as the feast of Christmas came before the feast of the Annunciation and maintained greater prominence; so too, the feast of the Nativity of Mary was prior and was more prominent in the life of the Church, until the most recent times. The Church celebrates the feast of the Nativity of Mary because she was holy in her birth – she was born free of original sin. St. Thomas appeals to this point explicitly in a sed contra (of ST III, q.27, a.1) to defend the doctrine of her sanctification in the womb. Precisely because Mary was freed from sin while in the womb (or, as we now know, from the first moment of her conception), we celebrate her birthday as a solemn feast. Nine months after the celebration of her Immaculate Conception, the Church honors our Lady’s Immaculate Birth. In fact, the Nativity of Mary is historically prior in the Church to her Immaculate Conception. Long before there was consensus among theologians regarding whether Mary was conceived without sin, nearly all agreed that she was at least born without sin. The Feast our Lady’s Nativity is more ancient than that of her conception, and this later feast’s date was determined by the date of her birth – much like the feast of the Annunciation was set according to the feast of Christmas. How pleasing it is to consider the order of revelation and the order of history: Though Mary had been preserved from sin from the moment of her conception, the Church first recognized the holiness of Anne’s daughter in birth and only later came to understand that her sanctification came at the first moment of her existence. As Christmas is a higher feast than the Annunciation, so too, Mary’s Nativity was a feast long before the feast of the Immaculate Conception. Perhaps someday, her Nativity will again rise to prominence. These words of St. Paul are written to remind us that any true knowledge of the divine mysteries comes not from men, nor from the spirit of the world and worldly wisdom, but only from the Holy Spirit. Hence, we must have the Spirit of God living in us – that is, we must be moved by the Gifts of the Holy Spirit. However, upon reading that only the Holy Spirit knows the things of God, we might be led to wonder whether the Father and the Son know what the Spirit knows. Indeed, St. Paul seems to speak exclusively of the Spirit, no one knows … except the Spirit. Is it true? Does the Holy Spirit have some special knowledge which is lacking to the other two Persons of the Blessed Trinity?